My trip to Seoul, South Korea with the Peace Belt demonstrated that the Peace Belt is indeed a link between cultures symbolizing the common goal of World Peace as envisioned by Peace Belt creator Wendy Black-Nasta. I arrived in Seoul with one contact in the dance world, Le Jong-Ho, found by an American friend who had been teaching English in Korea for a year. Mr. Lee was the only contact we would need. He is active in Korea's top Dance related organizations including President of CID-UNESCO, Artistic Director of SIDance Festival, President of the Korean Society of Dance Critics, and others. I first met Mr. Lee with his assistant and translator, Shina Kim, in a café featuring English language books about Korea. Over tea, we spoke of their idea to include the belt in two prestigious performances on Friday and Saturday evenings in the grand Seoul Performing Arts Center. I was thankful for their generous scope of vision and impressed by their willingness to work with a foreigner whom they had never met before, and with such short notice before the upcoming shows. They were warm, encouraging, and spoke with humility about the opportunity to have the South Korean dancers included in the Peace Belt world tour. This initial interaction was my first encounter with Koreans in which I felt that I was immersing and integrating into their culture. The Peace Belt was opening a door. A press conference was organized during which photographs were taken for the performance's program and for the Korean Times. When I took the Peace Belt out from it's wrapping, the half dozen media people present gasped in awe. They wanted to look closely at the coins and gems from around the world, feel the weight of the belt, and search for a coin from their own country. The ensuing article and photograph of me with the belt was in the Korea Times prior to the performance. I was invited to watch one of the dance troupes rehearse and was introduced to the performers through a translator. Through their gracious demeanor and despite the language barrier, they let me know that they were pleased to incorporate the belt into the performance. Watching the rehearsal was the first exposure I've had to any Korean dance. It taught me something about the soul of the people that was not apparent as I walked through the streets of Seoul. I saw the Korean spirit come alive. The night of the performance felt glamorous. It was a treat to see the audience arrive and to know that they were participating in something that would connect them with other Peace Belt audiences around the world. The Director of both performances was Mr. Jin Ok-sub. 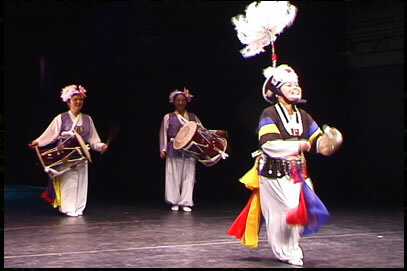 One performance featured Ms. Kim Dong-un of Shimchung Gut, a Shaman Ceremony. The other featured Ms. Yuh Soon-ja from a renowned female troupe showcasing the instrumental music of peasants. Watching the Peace Belt be worn in performance with the audience was a thrill. Knowing that the dances were traditional cultural dances that have been performed ritualistically over time made me feel that the peace belt was not just linking cultures of today, but also connecting the past with the present; a present that is building toward a positive and peaceful future. After the performance Jaehee Kim, of the Jiudau Organization, approached me. Ms. Kim was organizing a Peace Festival between North and South Korea to be held in February 2004. She invited me to return to Seoul with the Peace Belt and incorporate it into the festival. I proudly accepted. Two days before I was scheduled to depart for the trip, I received the unfortunate news from Ms. Kim that the festival had been cancelled. The Foreign Ministers of North and South Korea had met in Seoul that week and displayed 'aggressive behavior' toward one another. The North had forbid its people to participate in the festival. Hence, the festival was cancelled, or in a positive light, postponed. This cancellation was not a disappointment but a validation that the work of Artists for World Peace and the Peace Belt project is vital: We must continue to form links with Peoples of the world where there are links waiting to be made. We must also persevere to reach those whose governments' create illusions of distance and indifference.